Over the years, many people have contributed in different ways to the life of Braughing and have touched our lives, leaving us with some dear memories. Here, we remember some of our friends and recall memories of times gone by. She was born more than 94 years ago at the Bird in Hand pub in Green End to Henry and Maggie Glazebrook. She was the eldest of six children – four brothers and one sister – Roy, Peter and Joan are with us today. She went to Braughing school until she was 14 and was a star pupil - we have several of her school books which confirm this. She often had to stay off school to help her mother at home with the washing and the younger children – it was a daughter’s duty then. She always regretted not being able to continue her education. On leaving school she went into service as a housemaid at Hamels Park – a boarding school for girls. She told us how the cook would make cocoa at night and occasionally give her a can full to take home, on her bicycle, for her brothers and sister – a real treat! In 1941 at 18 years old She volunteered for the Women’s Air Force and became a balloon operator. She was once caught taking coal which had fallen from the trains to try and heat their freezing Nissan Hut. The policeman asked what she was doing and on explaining to him he helped her fill the bucket and carry it back to the balloon site. 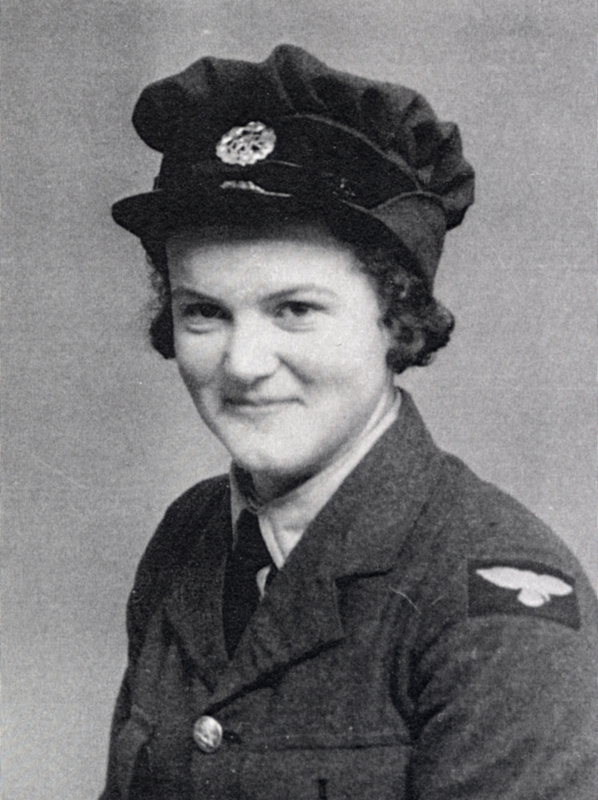 She worked on several sites and was released from service in 1944 returning to Braughing and working at Martin’s garage. She married Les in December 1946 – she used to say he was the only one left but they were married for 67 years so it can’t have been all bad! She was a very caring person and was always the first to offer a helping hand. She was well respected in the village and became involved in many local organisations. She was a founder member of The Playing Field Association Trust which raised the money to buy and develop the playing field in Green Lane and ran a 100 club for thirty years to help raise the funds. As children we spent many a school holiday collecting large sacks of stones from the land in preparation for the grass seed! She served for 25 years on the Parish Council becoming the first female chair and bringing her common sense attitude to the meetings. She was an enthusiastic walker of local footpaths in order to protect and conserve them for future generations. She was involved in the local women’s section of the Royal British Legion and became the Standard Bearer. She organised the poppy collection, a poppy seller for over 40 years – and was presented with an engraved crystal vase for this achievement. Her involvement in village life included many more activities including being a school governor, brass cleaning in this church, treasurer of the Horticultural Society, Women’s Institute, Golden Age Club, History and Braughing Societies, Scrabble Club, Sunday Teas, Neighbourhood Watch – the list is endless. Dad used to say he didn’t need to belong to any of these things as he was involved by default! When we were young she worked at the school and later worked in the shops in Braughing – she always like to be busy. She finally retired from Jones aged 70! She had a rare blood group and as well as receiving a Wedgewood plate for 100 donations the antibodies in her rhesus negative blood was in demand for new born babies and she was collected from Braughing and taken to Brentwood once a month to donate this. In all she gave 186 pints – receiving many more awards. You may wonder how she had the time to bring up three children but Allan, Sylvia and I cannot fault her as a mother. We consider her to have been ‘firm but fair’ being the parent who gave the love and support as well as the punishments. She was an excellent cake maker and there would always be something ‘cooling’ when we came home from school. Her meals were not quite so adventurous and as children we could tell what day of the week it was by what we were having for dinner – but I don’t think we were any different to the other families around us. As a grandmother she really found her vocation. She was devoted to them and delighted in everything they did. We had beautiful hand knitted clothes for them and endless hours of babysitting. Dancing classes were held in the Church Room on a Saturday morning and she provided bed and breakfast for them on a Friday night and encouraged them to become ballet dancers the next morning – not something they all achieved! They were indulged and could have almost anything they asked for – milkshake on their cereal which of course they didn’t eat because it tasted awful! She cooked their favourite meals and allowed them to turn the furniture upside down to make camps in the front room. She read them endless stories, played card and board games and took them out for adventurous walks down the Bone. Cassie remembers that as a treat they were allowed some ice gems and dolly mixtures in an eggcup – not too many though! I just wish she could have got to know her beautiful great grandchildren Claudia and Francesca as she would have loved them too. Sadly she developed memory loss several years ago and we all supported both dad and her which meant they could stay in their own home. We took on many of the tasks but Dad was still left with her care – he wouldn’t have it any other way, until he died two years ago. Even though she struggled with day to day things she still wanted to make a cup of tea when we called – even though one of us had to follow her out to the kitchen and remind her of what she was doing. We would like to thank family in the village and Mick and Mandy who all kept an eye on them. We realised that she would be unable to live on her own and she came to live with Geoff and I. With the support of Allan and Sylvia and the grandchildren we were able to keep her with us until it became too difficult for us all and she went into the dementia wing at Margaret House in April. By this time she had no idea where she was and settled quite happily - having lots of people around and lots of things going on for her to watch. We were very pleased with her care and got to know the staff and other residents well. We were all able to visit often and there were very few days when one of us was not able to see her. Sylvia likes to think she still knew us but I think she just saw us all as a friendly face. She could remember her life from a long time ago and remembered her brothers and sister -long after she had forgotten dad and her children and grandchildren. Once while looking at old photographs we came across one of us all taken in the back garden at Green Lane – she picked out herself but went on to say of the rest of us ‘and that was the man, that was the boy and those were the girls’. Luckily we found it funny but it was rather sad. I would like to finish with a poem that Sylvia came across which we all felt described her perfectly in the last few years. There is no doubt that we all loved her very much as we know she loved all of us. Known as Graham Ward, he died peacefully at home in his sleep on 23rd March 2011 at the tender age of 89. David died peacefully at home on 8th November 2011, aged 84, cared for by his wife, Doreen. David was the pastor of Braughing Chapel for around fifteen years. He was also a founder member of the Braughing Historical Preservation Society, and always cherished very happy memories of living in such a beautiful village. Val, as she was almost always called, grew up first in Whitley Bay, Northumberland, and then in Harrow, Middlesex. She studied English at Hull University and met Malcolm there in her first term. They married in 1964, first living in Stanstead Abbotts then moved to Braughing Friars in 1973 with their two sons, Brandon and Darrell. In 1980 they made major alterations and extended the modest bungalow they had bought. Val supervised and project managed all the work. David Marques was born on December 9 1932 at Ware in Hertfordshire. He was educated at Yandle Court School and at Tonbridge, where he played in an undefeated first XV with Colin Cowdrey, later famous in another sporting context. After national service in the Royal Engineers, he went to Cambridge to study Engineering and won four blues for rugby. He also played for the Army, for the Combined Services and for the Barbarians, with whom he toured Canada and South Africa. We were all saddened to hear that, after a short illness, Marie Sole had passed away. John’s funeral was held on 2nd March and his ashes now rest in St Mary’s Braughing’s churchyard. Andy was born in Neath, Wales, and moved with his family to Southgate in 1945. He was educated at University College School and in 1958 left to study law. He qualified as a solicitor in October 1965 and joined Unilever in 1968. Felicia was born in Lincolnshire the fourth oldest of six children. In her early years she attended Cheltenham Ladies College and then went to Eastbourne Domestic College to be ‘finished off ’ and learn to cook. David was born in Cardiff and was one of three children of Richard Austin Owen who was Assistant Headmaster of Gladstone School, Cardiff. His father died when he was eight years old and he and his brother, Bill, went to Josiah Mason’s School in Birmingham. Braughing has lost one of its most outstanding characters. Derek White passed away peacefully at home on 9 February after a two year illness which he coped with courageously. In spite of his discomfort he continued with all his village activities and four days before his death was helping out at the village Fellowship Sunday Teas. Derek was always so cheerful – constantly smiling and joking – never complaining. Kathleen Olive Filby (née Young) was born at Corringham in Essex. Sadly, Braughing lost another well-known member of the community last month. Lilian's funeral was held on 16th April in St Mary's Church. Susan was born in Isleworth on 16th July 1947 and went to school in Surrey. Albert's funeral was held at St Mary's Church, Braughing on 30th October 2002. He was born in Braughing in 1915, in the same house in which he finally died. On 27th August 2002 Braughing lost one of its most loyal friends. At her funeral on 6th September, and subsequently, there have been many tributes to Lady Melville, bringing to light just some of her gifts and talents. Ivor Spencer-Thomas died on 30th August, aged ninety four, and was buried close to John O'Groats, Scotland, with his wife, Rosabel, who had died almost three years earlier. We send our sincere sympathies and condolences to their children, Rosemary and Owen and family. The funeral service for Sir Ronald Melville was held at St. Mary's Church, Braughing on Monday 11th June 2001.